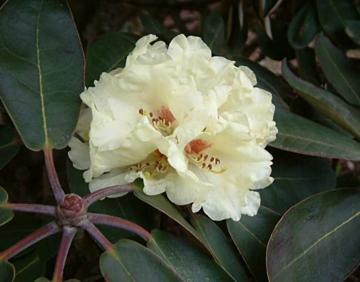 Slow growing, ultimately large, evergreen shrub. Oblong-elliptic, dark green leaves with a brown or buff indumentum on the undersides, up to 17cm long. Trusses of bell-shaped, pale yellow flowers, sometimes stained pink and with a red blotch inside, in mid or late spring. Needs a sheltered location with a moist lime-free soil. Not strong growing and should only be positioned where conditions are suitable.